A huge congratulations from the Frontline Club to member Tim Hetherington and Sebastian Junger for their incredible success at this year’s Sundance Film Festival. Their documentary Restrepo won the Grand Jury Prize in the U.S. Documentary Comptetition. Restrepo is an incredible documentary that chronicles the deployment of a platoon of U.S. soldiers in Afghanistan’s Korengal Valley – considered one of the most dangerous postings of the war. The film puts politics aside to get to the heart of the experience these soldiers face over the course of a year. This year’s judges for the Grand Jury U.S. Documentary Comptetition were filmmakers Greg Barker, Dayna Goldfine, Morgan Spurlock, Ondi Timoner and Wired senior editor Nancy Miller. 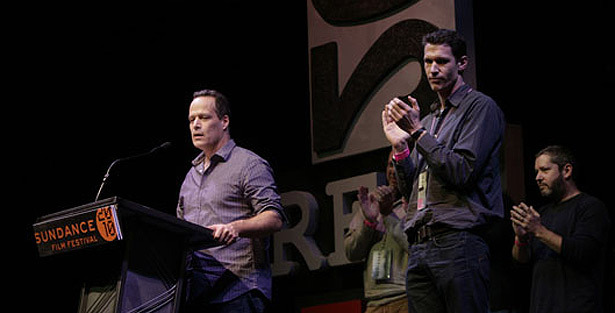 Restrepo wasn’t the only film with a British director to do well at Sundance, Enemies of the People by Rob Lemkin and Thet Sambath won the Special Jury Prize in the World Cinema Documentary Competition and Lucy Walker’s win for Wasteland added to her incredible achievement of having two documentaries at the festival, the other being Countdown to Zero. My review of Restrepo for The Documentary Blog and Sundance coverage can be found here. I also want to add a congratulations to the filmmakers of films shown at the club nominated for this year’s Oscars. China’s Unnatural Disaster: the Tears of Sichuan Province has been nominated in the Documentary Short category. Jon Alpert and Matthew O’Neill kindly came and gave a wonderful Q&A a few weeks ago and we wish them the best of luck on March 7th. Burma VJ and The Most Dangerous Man in America: Daniel Ellsberg and the Pentagon Papers are both nominated in the Documentary Feature category, congratulations to filmmakers Anders Østergaard, Lise Lense-Møller, Judith Elrlich and Rick Goldsmith. For more information about Restrepo, the website is here.